At the very end of the year, Valve announced the winners of the first Steam Awards. 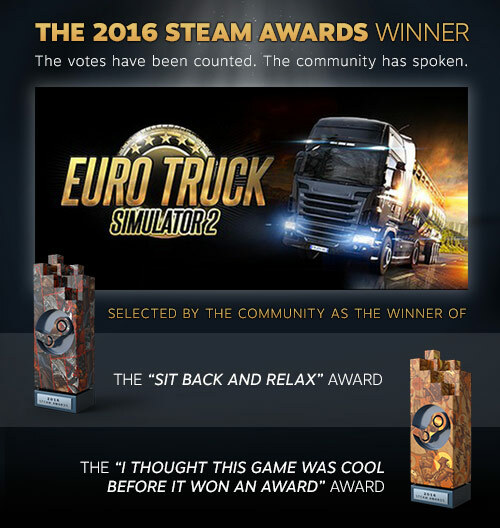 And we got the most amazing gift: Euro Truck Simulator 2 is among the winners, in fact receiving both awards that it was nominated for! We want to thank all of you who have given us a few minutes of your time to vote for our game. Our fan community is just fabulous! We are committed to improving and expanding Euro Truck Simulator 2 as well as American Truck Simulator in 2017 and beyond, you can look forward to some really good stuff! Seventy Thousand Keys and Still Going!